Picture this: you’re out on the lake fishing when your hook snags on the bottom. Pull and yank as you might, you can’t get it unstuck; you need to cut the line and rig up a new lure, line, and sinkers. You dig blindly through your bag, accidentally stabbing yourself on hooks, pulling out random lures until, ten minutes later, you find the right gear. Or, even worse, you left your gear in the car because you didn’t know how to carry it all. Now picture this: you’re out on the lake fishing when the line snags on the bottom. You calmly open your organized tackle box, and, in ten seconds, pull out all the gear you need. Which of these fishermen would you like to be? Only one of them had an organized tackle system. 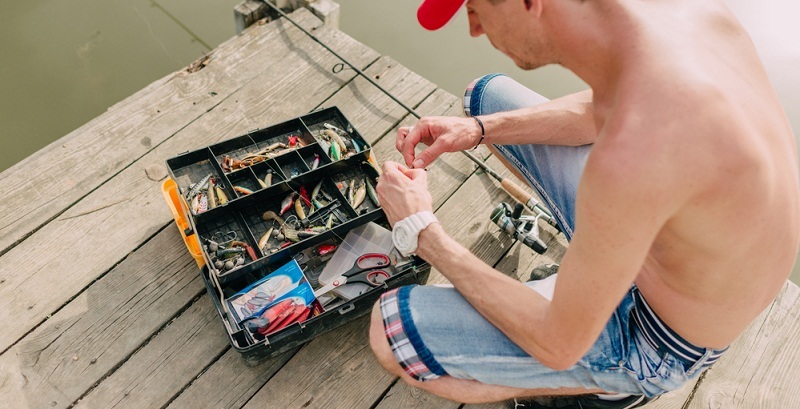 In this article, we’ll help you determine how to find the right tackle box for you, what to look for in the different kinds of tackle boxes, backpacks, and bags, and what is the best tackle box and bag, including for saltwater. You can’t fish without gear. A practical tackle system will have everything you need, including just-in-case items such as a flashlight, pliers, and your dog-eared copy of The Total Fishing Manual. The right system will also be organized, helping you find exactly which lure you need at the time, and it will transport comfortably from basement to car to boat, and back. It will withstand bumps and drops, and it will keep its precious cargo protected and dry. Size: Tackle systems range from simple, flat boxes to gargantuan contraptions with removable racks, trays, and drawers. A casual vacationer out for the day is not going to need the latter, but do remember that a tackle system may also have to hold accessories such as drinking water and a cell phone. If you’re just starting out, find a small, basic box; by the time you outgrow that, you’ll have a better idea of what you need. Quality: As with any product, some tackle boxes and bags are better made than others. Look for thick, durable fabric, reinforced stitching, durable plastic, and large, thick zippers and clasps. Organizing system: From satchels to trays to hip roofs, there are oodles of organizing systems out there. Some fishermen choose to take everything just in case; others take only what they need for the day in a small, light box, leaving the majority of their tackle organized at home. With experience, you’ll know what works for you. Hard tackle boxes are made out of rigid plastic or metal, while soft bags and backpacks are fabric. They carry cargo very differently and are useful in different situations. See below for the pros and cons of each. Pros: The hard plastic of tackle boxes makes them durable, waterproof, and long-lasting. An infinite variety of organizational options from many brands makes it possible to find as simple or intricate of a system as you want. Some even sport removable drawers that become stand-alone boxes with their own internal drawers. It’s possible to use a regular toolbox for a tackle box, but it won’t keep small gear and lures organized. Cons: A single handle can make carrying difficult, and folding and unfolding tons of trays every time you want to find something can be a pain. In below-freezing weather, plastic becomes brittle and breaks easily, unlike fabric. 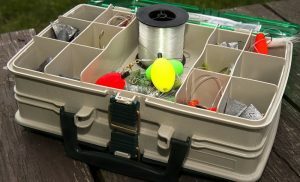 When to Use a Hard-sided Tackle Box: For shorter trips, tackle boxes keep small amounts of gear organized and protected from the elements. What to Look For: Worm-proof tray technology keeps lures crisp. In your dad’s old toolbox, those same lures will become soft and sticky and melt together. Pros: Tackle bags are lightweight. Padded straps and moldable bodies make carrying comfortable, and they compact easily for storage. Extra pockets and compartments flex and stretch to stuff in that last thing, and they conform to oddly-shaped contents. Organization using numerous removable trays is endlessly flexible. Many bags include removable velcro dividers to customize the shape and size of inner compartments. Cons: The fabric is usually water-resistant, which won’t keep your gear dry. Stitching, zippers, and fabric won’t last as long as hard-sided boxes. When to Use a Tackle Bag: If you have tons of small gear that you want to organize in interchangeable trays, a tackle bag can do that for you. What to Look For: Durable, water-resistant fabric and quality stitching, especially where the straps attach to the bag, will go a long way towards making your bag last. Tackle backpacks are basically tackle bags with backpack straps. One bag holds everything, including water bottles and accessories. Advanced models include hip straps and lumbar support for comfort when hiking long distances. For bushwhacking, portaging a canoe, or any activity that requires the use of your hands, a backpack may be the right choice. Pros: This medium-sized box features removable racks, a clear cover for easy viewing, and a large upper container for bulkier items. With Plano’s legendary name behind it in the form of a limited lifetime warranty, this box will last forever. Cons: It doesn’t ship with all the boxes pictured in the photo; you have to order some of them separately. Plastic latches raise some concerns about durability, even with the warranty. Pros: Plano’s angled system makes removing trays and gear easy. Deep compartments on the side hold bulky items, and rubber feet keep the box from slipping. Like the previous box, this one (and all Plano molded boxes) come with a limited lifetime warranty. Cons: For some reason, boxes of a similar size seem to hold much more gear than this one. The thin plastic isn’t durable, and we’ve heard complaints of boxes arriving broken. Pros: Pockets. Lots of pockets. The Spiderwire Wolf has an insane amount of different compartments, big and small, including tool holders and room for four interchangeable plastic trays inside (included with the bag). The outer mesh pocket, a nice addition, is rubberized for strength, while the heavy-duty bottom and 1680 denier nylon fabric will last a lifetime. A vertical organization system makes removing one tray a breeze. Cons: While the bag itself is made well, the plastic boxes inside are neither functional nor durable. The fabric is water resistant but, being thick, will take a long time to dry, making it susceptible to mold. Pro Tips: Change the inner boxes out for Plano 3750s, which will fit perfectly and hold up better. The Wolf also comes in a backpack version. 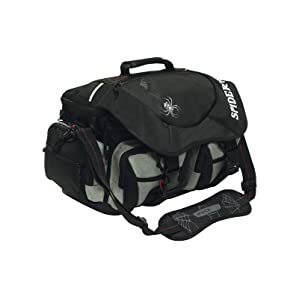 Pros: This tackle bag has a wide, cushioned shoulder strap and numerous outer and inner pockets, including a water bottle holder and a mesh cargo net. Water-resistant fabric and a reinforced bottom keep your gear protected. The bag doesn’t come with plastic trays, but you can use almost any system of trays and drawers due to the movable velcro inserts. Cons: Add a few extra pockets to any duffel bag, and you’ve got this tackle bag. Although practical for light use, it’s not going to last very long due to thin materials, low-quality stitching, and cheap, metal zippers. In any saltwater use, rust is imminent. It’s also smaller than it looks online. Pros: This backpack is HUGE: it can hold up to six trays in the lower compartment alone. Adjustable, padded straps keep heavy loads comfortable. Two entrance points access gear in different ways, while tons of pockets – internal and external – compartmentalize the small stuff. This pack also includes boatloads of gadgets, including self-retracting tool lanyards, a protective rain cover, a flip-up LED light system on the inside for low-light conditions, and more. Cons: One of the benefits of soft tackle bags is their light weight, but the Nomad, weighing in at 5 lbs, definitely isn’t light. Like many of the easily-broken gadgets, the LED is low-quality, and, if it even needs to be said, water and electronics don’t mix. We’ve heard reports of the battery compartment melting and stitching coming loose. Pro Tip: A slightly smaller version of this backpack comes with a built-in rechargeable battery. Pros: The MT Large Backpack is Wild River’s Nomad without the gadgets. It holds a ton, is customizable with a Velcro divider, and provides comfort with adjustable, padded straps and lumbar support. And they didn’t leave out all the little details; it comes with two plastic trays, and the clear inner pocket is perfect for a fishing license and electronics. Cons: The durability of this backpack, like that of many soft-sided bags, is questionable due to flimsy zippers. 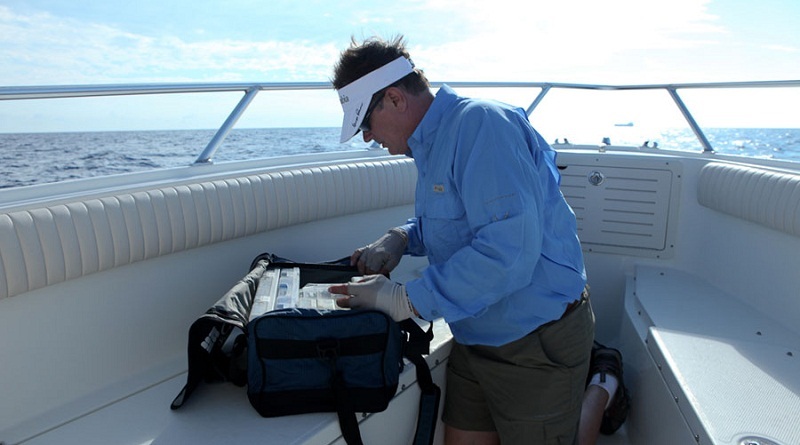 What to Look For: When saltwater fishing, you need a bag or box that can stand up to the elements while protecting your gear. Look for thick materials and nylon/plastic zippers (not metal) or Velcro closures. Backpacks will likely be unnecessary. For a tackle box, look for one that’s durable and closes firmly to keep your tackle in and salty spray out. You also may need larger gear, and more of it, than when freshwater fishing, so look for a capacious box. 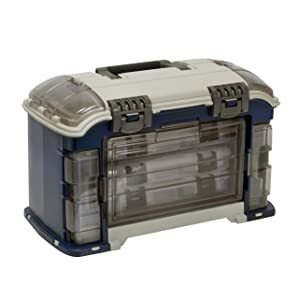 Saltwater Tackle Box: Plano’s 7771 Series is extremely functional and durable, and it closes firmly using plastic latches, so you don’t need to worry about any part of it rusting. Saltwater Tackle Bag: SpiderWire’s Wolf has thick fabric and a durable base to hold up to the elements, and it holds tons of gear in its seemingly unlimited number of pockets. The zipper sliders are metal but are protected against corrosion. The right tackle system can make or break a successful day out on the water, and that system starts with the container. We’ve outlined some good options here so you can get your gear organized and your hook in the water. How do you organize your tackle? Leave a comment below. 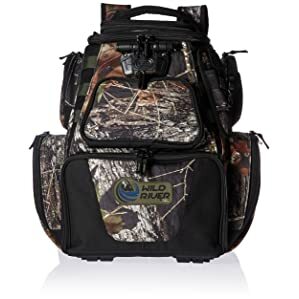 Best Hunting Backpack Reviews 2019 – Which Could Carry Everything? You know something? I have never really ever thought about getting a tackle backpack. These options are amazing. I am going to pick one up since I hate carrying around all the tackle in a box. 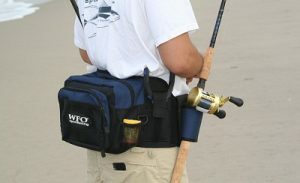 Tackle backpacks are the best option when you are fishing on the move. They fit just about everything that I need in one pack and are very comfortable on my back. Thanks for showcasing these! 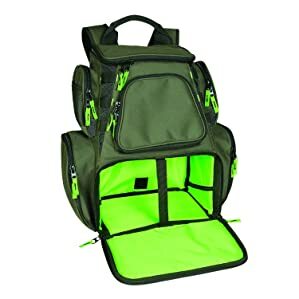 These tackle backpacks are perfect for what I need them for. I film a fishing show and always need to keep my hands free. Thanks ! I was very surprised to read this. I am looking your post and i am interested. You post is very useful and reliable. 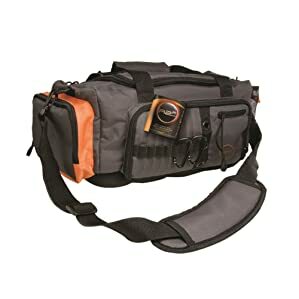 Recently i discover your site and review your product list and i buy a Wild River Multi Tackle Large Backpack. I am so happy. thanks. Here is very excellent fishing tackle box. 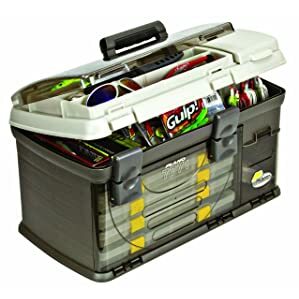 It’s very need for fishing to keep your fishing gear in this tackle box. You additionally want to make sure that you all of your tools is heavy duty so it can cope with the big fish you’ll discover within the depths of the sea.